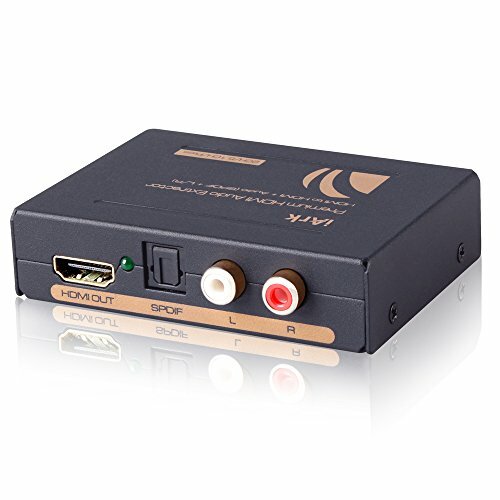 This HDMI audio extractor has one HDMI input, one HDMI output, one Optical SPDIF and RCA L/R stereo audio output. It extracts digital audio embedded in HDMI source and outputs via optical SPDIF (up to 5.1 Dolby Digital and DTS) or 2CH RCA L/R stereo. It's a perfect solution for amplifiers/receivers/sound bars that do not have HDMI inputs, and suitable for various HDMI source devices that do not have dedicated audio output, such as Roku, Chromecast, Blu-ray/ DVD player, cable box, Amazon Fire TV, Apple TV, PS3/4, Xbox, HD camera/DVR, etc. 2CH Mode:Set to 2CH to get RCA L/R stereo output. It can extract digital 2CH PCM stereo audio from the HDMI input and convert it to 2CH analog stereo output through the RCA L/R port. Note the RCA L/R output will not have sound if incoming is multi-channel (>2CH) audio. 5.1CH Mode: Set EDID to 5.1CH to get 5.1 channel digital surround. The SPDIF optical audio output supports incoming audio formats up to 5.1CH Dolby Digital and DTS. It does not support Dolby TrueHD, DTS-HD Master Audio, 5.1CH PCM, 5.1 Dolby Digital Plus and above. Please turn off Dolby Digital Plus on Amazon Fire TV, Roku and Chromecast. PASS Mode: For 5.1/7.1CH PCM, Dolby Digital Plus, Dolby TrueHD and above, set audio EDID to pass and connect HDMI output to your receiver directly. Note: SPDIF and RCA will not have sound. Manufacturer: ASK Technology Co., Ltd. Publisher: ASK Technology Co., Ltd. Studio: ASK Technology Co., Ltd. If you have any questions about this product by iArk, contact us by completing and submitting the form below. If you are looking for a specif part number, please include it with your message.